John Cusack is Brian Wilson. Yes, that Brian Wilson. He of the Beach Boys. If that seems like a strange piece of casting, then be assured; it is a strange piece of casting. It is something that this long overdue biopic-of-sorts fails to truly overcome. Whilst Cusack is a reliably charismatic screen presence in pretty much anything he puts his loquacious, sardonic and charming self to, he cannot quite morph into the wrecked, racked and, let’s face it, chubby, elder Wilson. 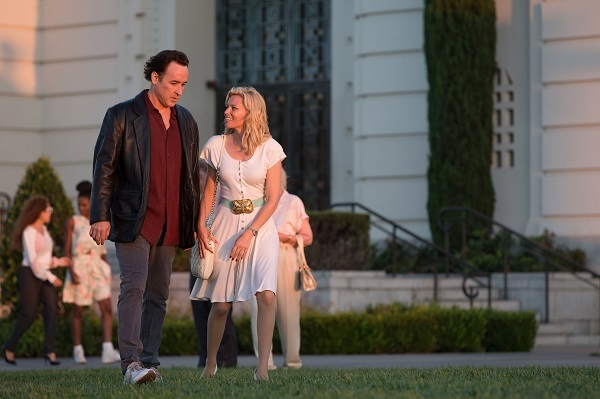 Helmed by 12 Years A Slave producer Bill Pohlad, Love & Mercy only occasionally satisfies, despite arriving with an abundance of goodwill and eager anticipation for it to succeed. The story approaches matters from multiple angles, darting back and forth from the late-80s/early 90s period when Wilson – in the grips of stifling medication and deteriorating mental health – met future wife Melinda Ledbetter, and the mid-60s period during which his emergence from within the Beach Boys dynamic started to take place. In fact, it is this 60s period that is the most successful portion, featuring an astounding performance from emerging talent Paul Dano. It starts with Wilson’s withdrawal from touring with the group – as he voluntarily slunk deeper into the channels of his extraordinary creative impulses – to begin work on what would become their opus; Pet Sounds. With the group away on tour in Japan, Wilson would spend his time scrutinising his new material with a select band of studio musicians, which included the legendary sticks man Hal Blaine. By contrast, the later period sees a childlike and mentally curtailed Wilson scramble for clarity and independence from the fog of paranoid schizophrenia. The medicinal measures presented as necessary restraints by Dr Landy (Paul Giamatti) are revealed to be at least partially bogus. Rather predictably, and with what is often his wont, Giamatti shines. His relish at playing the villain of the piece is palpable and infectious for the entirety of his involvement. Meanwhile, well-meaning Melinda (Elizabeth Banks), is presented as a gentle guardian angel, who observes the fractured Wilson and seeks to instil some sort of defiance and control back into his life. She helps pave a way through the thickets of his obscured mind as he starts to make that a reality. As chronology is played with, Pohlad does not forget to reference the destructive influence of the Wilson patriarch upon Brian. The cinematography adeptly flicks a filter to the 60s sections, before resolving into crystal clear definition for the latter day period. Quite refreshingly, there is a lack of notation on the time frames depicted. It is very much left to the audience to engage with the narrative(s) without an obsession on time and place. The overall effect of Love & Mercy is that it is a somewhat muted celebration of a bona fide recording maverick and song writing genius. Instead, we have the sombre battle for the reclamation of identity played as the centrepiece. Maybe that is unavoidable. Wilson’s troubles are well documented, after all. Intermittently, this is a success. On the flipside, and somewhat inevitably, that also means that it is intermittently a failure too, with a latter day period that feels more than a tad disjointed and uneven. A mixed-bag that cannot help but be a minor disappointment. This entry was posted on 08/02/2015 by toomuchnoiseblog in Reviews and tagged berlin film festival, berlinale, bill pohlad, biopic, Brian Wilson, elizabeth banks, Film, Greg Wetherall, john cusack, music, paul dano, paul giamatti, Review, the beach boys.